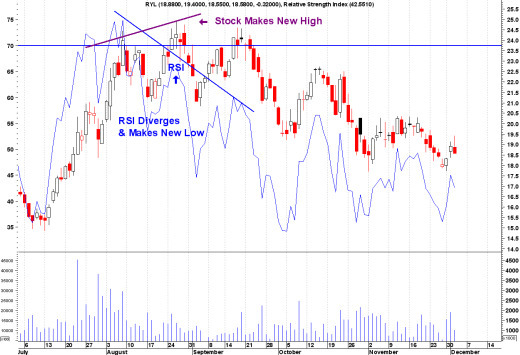 The RSI - Relative Strength Index, falls under the category of an "Oscillator" indicator. And the value of an Oscillator indicator, is to determine when a stock has reached an overbought level, or an oversold level. Developed by Welles Wilder, it measures the internal strength of a stock and compares the magnitude of a stock's recent gains to the magnitude of its recent losses, and then turns that information into a number of ranges from 0 to 100. 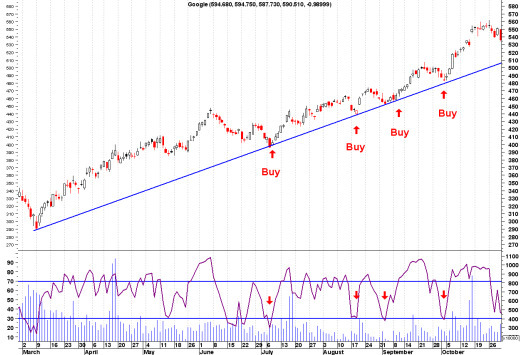 Simply put, this Indicator is one of the first indicators of an upcoming reversal of a stock trend, either up or down. For further in-depth information on the RSI Indicator, this resource contains critical information to help you learn to use stock charts and technical indicators in a clear, simple and concise manner to improve your trade entries and exits in the stock market. As shown on the chart above and on the bottom left hand side, the Relative Strength Indicator is shown to be overbought at the 70 position, and oversold at the 30 position, on a scale of 1 - 100. Using a short-term R.S.I.-setting, such as 5 days, once an up-trend is identified, when the stock dips and the indicator goes to an oversold level at or below 30, and turns back up, a stock trader can buy at this position. The opposite would be true in a down-trend, with 70 being overbought. The most significant and strongest signals given by the Relative Strength Index are generated on price divergences between the R.S.I.-indicator and the price of the underlying stock. Bearish divergences give sell signals. As shown in the chart above, a bearish divergence is shown when the price rallies to a new peak, but the R.S.I.-indicator makes a lower top than during the previous rally. The stock share price eventually falls. Sell signals are especially strong if the first RSI-top is above its upper reference line (70 on left hand side), and its second top is below it. Bullish divergences are the opposite. Double Bottom patterns and Double Top patterns work well with this indicator. Is there a specific RSI Indicator Strategy or Technique that you use, that is not described on this page? Here is your opportunity to share your RSI Indicator expertise and technique, to help and coach other newbie Stock Traders become more proficient and confident on their journey to Stock Trading Success and Profitability! Return from "Relative Strength Indicator" to the Home Page: "Stock Market For Beginners"